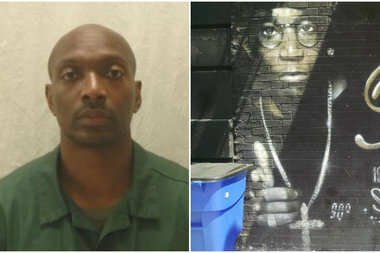 Gerard Woodley, left, was fatally shot Thursday about 20 years after he was arrested for killing rapper Big L, pictured at right in a memorial mural in Harlem. HARLEM — The chief suspect in the murder of rapper Big L in 1999 was gunned down in Harlem Thursday night, sources said. Gerard Woodley, 46, who is suspected in four other homicides, was in front of 106 W. 139th St., near Lenox Avenue, about 11:17 p.m., when someone shot him in the head, NYPD officials said. Woodley, who lived at the West 139th Street building, was pronounced dead at Harlem Hospital, police said. There were no immediate arrests and police didn't release a description of the suspect. Woodley has a long history of violent crimes and was released from prison in September 2015 after serving four years on a weapons charge unrelated to the rapper's death, officials said. "He did a lot of bad things and someone decided it was time to go," the source added. Law enforcement sources said Woodley was trying to keep a low profile lately, but got involved in illicit business in New Jersey, which may have led to his murder. Woodley has been arrested six times, first in 1990 on a weapon charge, an NYPD spokesman said. He was arrested again in 1994 and 1996 on murder charges, but avoided conviction both times, MTV reported in 1999. An NYPD spokesman couldn't confirm those charges because the cases are sealed, he said. Then in 1999, Woodley was arrested for fatally shooting Big L, who had already earned the respect of underground hip hop scene and was seemingly about to become a big name, sources said. Woodley and Big L, whose birth name was Lamont Coleman, were childhood friends and often spent time together, family said. 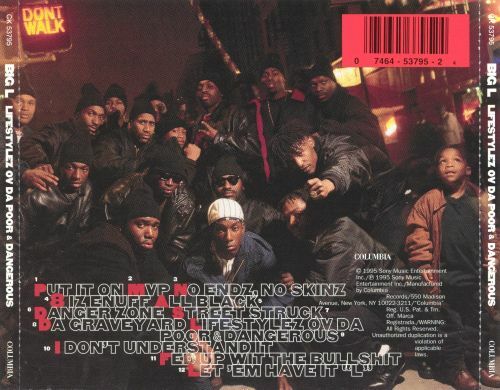 Woodley appeared on the back cover of Big L's 1995 debut album "Lifestylez Ov Da Poor & Dangerous." "They were good friends. We were friends with the family even after he was killed. We still talked," said Woodley's aunt, Rosa Townes, 85. Investigators believe that in 1999, Big L was part of a crew that robbed drug dealers, sources said. Police believe that the rapper would double-cross people he knew by letting the robbery crew know the location of cash-carrying drug dealers prime for a stickup. Though the details are sketchy, sources believe that Big L's side-business was deleterious to Woodley. The two had a falling out and Woodley exacted revenge on Feb. 15, 1999, shooting Big L nine times in the face and chest on West 139th Street, near Lenox, reports said at the time. Police arrested Woodley, but the Manhattan District Attorney later dropped the case against him because they felt they didn't have enough witnesses and couldn't find any incriminating surveillance footage, sources said. Federal investigators were also closing in on Woodley on a guns case, sources said. Prosecutors knew he was likely to do time on those charges so they didn't pursue the murder case as aggressively, sources said. Woodley spent five years behind bars on the federal guns charge and was arrested again in 2010, also on weapons charges, sources and police said. He was released to parole in September 2015, records show. Investigators don't believe his murder was tied to Big L's death because anyone who would have wanted to exact revenge had many opportunities in the 20 years since it happened, sources said. His family was left reeling after he was killed, they said, adding that he left behind a 28-year-old daughter. "He was a pretty good guy. My mind is gone. I didn't sleep last night. It don't make sense," said Woodley's aunt, Rosa Townes.